Alex Wong/Getty ImagesSens. Susan Collins and Joe Manchin. Republican Sen. Susan Collins of Maine indicated on Friday that she planned to vote to confirm Brett Kavanaugh, the embattled Supreme Court nominee, during a final floor vote set for Saturday. 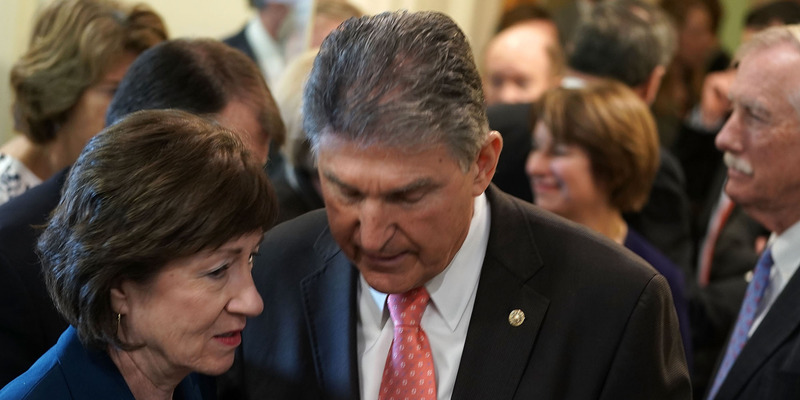 After Collins announced her intended vote, Sen. Joe Manchin said he would also vote to confirm Kavanaugh. With their votes, it appears all but certain that Kavanaugh will be confirmed to the Supreme Court. Kavanaugh, a federal judge on the Court of Appeals for the District of Columbia Circuit, has faced allegations of sexual misconduct dating back to the early 1980s. Republican Sen. Susan Collins of Maine indicated on Friday that she planned to vote to confirm Brett Kavanaugh, the embattled Supreme Court nominee, during a final floor vote on Saturday. She voted earlier Friday to invoke cloture on his nomination. Shortly after Collins’ announcement, Sen. Joe Manchin, a West Virginia Democrat, announced he would also vote to confirm Kavanaugh. Collins spoke for more than 40 minutes on Friday afternoon, concluding by announcing how she intends to vote. “Mr. President, I will vote to confirm Judge Kavanaugh,” she said. Manchin said in a statement after Collins’ speech that while he had reservations about voting to confirm Kavanaugh given the allegations against him, the FBI report about its investigation into the accusations led him to conclude that Kavanaugh is qualified to serve on the Supreme Court. With the votes from Collins and Manchin, Kavanaugh’s confirmation is all but certain. A moderate Republican who supports abortion rights, Collins had for months been scrutinised over her vote on Kavanaugh’s nomination. She is also the subject of an unprecedented fundraising campaign by Maine activists that they say will automatically trigger over $US1.9 million in donor pledges to fund her future opponent when she goes up for reelection in 2020 if she votes to confirm Kavanaugh. While Collins and Senate Majority Leader Mitch McConnell have decried the campaign as a form of bribery, two law professors, Deborah Hellman and Stuart Green, wrote in The Atlantic last month that it did not fit within the legal parameters of a bribe because it was threatening to give the funds to her eventual, unnamed opponent instead of offering her money to vote a certain way. Kavanaugh, a federal judge on the Court of Appeals for the District of Columbia Circuit, has been accused of sexual misconduct by three women. He has vehemently denied the allegations, which date back to the 1980s. His nomination proceedings were delayed so he and Christine Blasey Ford, who has accused him of sexually assaulting her in high school, could testify before the Senate Judiciary Committee and the FBI could conduct a supplemental background investigation, which it completed on Wednesday.